Plantation shutters by Norman bring a timeless and polished look to your home. Their visual appeal, innovative technology, and affordability continue to make them a popular choice with homeowners and designers. The window shutters are cord-free, so you can’t get entwined or injured by them making them a safe bet for children and pets. No dangling chords ensure that your home is a safe environment giving you peace of mind. 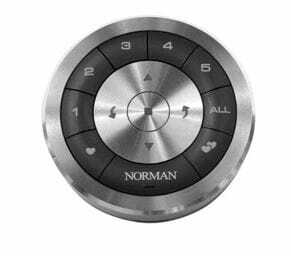 Norman has introduced a mission style shutter that is motorized and doesn’t have a tilt bar or visible hinges creating a sleek, ultra-modern look for your windows. These window treatments are not just any shutters, but custom handcrafted furniture for your windows and home automation at its best with an aesthetically pleasing design! They have also added a variety of colors including grey, which remains a favorite color for modern interior design. 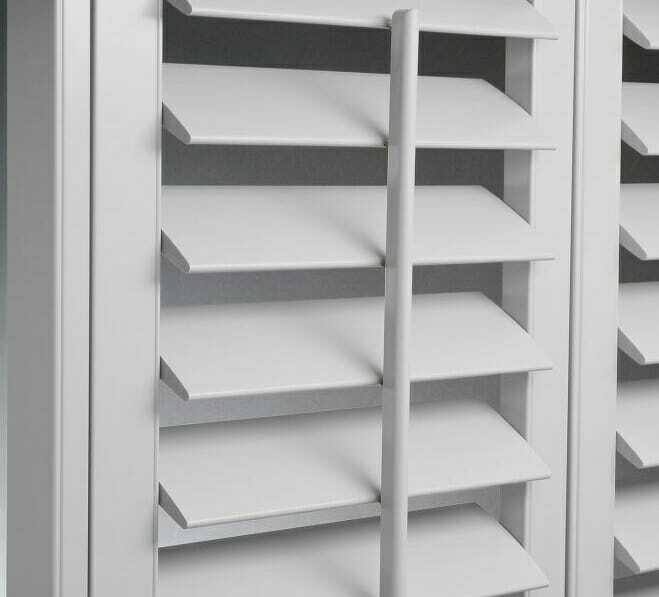 Norman motorized shutters are available in both composite and wood. Both of these options have distinct advantages. Wood is generally more appealing than composite as it has a classic more natural look and feel to it that cannot be replicated. The wood is FSC certified which means sustainably sourced from the forests to your windows. Faux wood composite shutters can be painted to match any color scheme which can be a plus when coordinating your home decor. Even though composite shutters don’t have the visual appeal of natural wood, they hold up to humidity and moisture better than wood as they are engineered to last longer and withstand temperature changes. Faux wood shutters are also easy to clean so a feather duster, soft cloth or a vacuum with a brush attachment is all you need to wipe off any dust. Due to their durability composite shutters are generally better suited to spaces like kitchens, bathrooms and children’s rooms. Keeping your budget in mind be aware that wood shutters are pricier than the budget-friendly composite option. Recessed magnets have been built into the back panel allowing the shutters to close easily stopping them from banging shut. The ultra invisible hinge system eliminates the need to see hinges on the outside of the shutter by concealing them thus keeping the design looking very contemporary. Staying with its modern appearance, the shutters use the invisible tilt system removing the need for a bar in the middle or back of the shutter. You can either use your fingers to open or close the shutters or opt to upgrade to a motorized blind that is powered by either battery or solar power. The motorized shutter is best suited for high, hard to reach windows or any window that you want automated with the push of a button. There is a built-in Lithium-ion battery pack at the back of the shutter ensuring for up to a year on a single charge (via USB port) and the least intrusive look. Another option is a remote control that has a dial on it that will enable you to position the blind to your specifications. Set the tone in your home day or night by controlling the amount of light coming or use them for added security. Easy to use, quickly responds to tilt commands and will adjust the shutter to the angle you want, while the built-in jam protection provides child and pet safety. Add both curb appeal and value to your home with Shutters by Norman. Motorized, modern convenience you can use every day. Want to learn more about faux wood shutters? For questions and to schedule a FREE consultation, call us at 858-452-6100, or set up an appointment to speak with one of our experienced window treatment designers.